Safely and easily removes standing water from your paintwork! The Gyeon Silk Dryer will help you safely remove standing water from your paint in only a few wipes! The secret to this innovative detailing towel is in the unique synthetic fibers. These fibers absorb a great deal of water with ease, allowing you to remove it from the paint without implementing micro-scratches and smudges. Even if you have very soft paint, this towel is safe to use and you will be impressed with the results! The Silk Dryer comes in two great sizes and can be used on cars with no protecting or protected with waxes, sealants or coating. 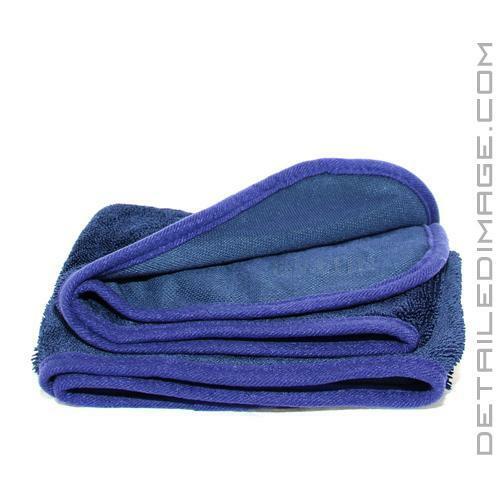 Gyeon also states that these towels are great for not only drying, but applying the CanCoat and final wipe downs with Cure. If you are looking for a versatile drying towel to add to your Gyeon product collection, the Silk Dryer is highly recommended! For in-depth instructions on how to use Gyeon View check out the article Gyeon Quartz Q2 Silk Drier: What It Is and How to Use It by Jeff McEachran, the national brand manager at Gyeon USA. Synthetic fibers are capable of absorbing impressive amounts of water without letting a single drop out. Gyeon Q2M Silk Dryer is the most innovative drying towel in 2015. Gyeon is the first to introduce this drying technology worldwide! Its unique synthetic fibers absorb impressive amounts of water with fineness. Its important feature is silk-smooth gliding over the paintwork, ensuring a scratch and smudge free drying process, even on the softest paintwork. Q2M Silk Dryer works equally good on coated and uncoated cars. Washing with Q2M TowelWash is highly recommended. I went out and purchased the top 4 brands of drying towels for my own little comparison. I don't care about the cost, I wanted the best. The Gyeon was not the highest rated at the time but ratings can be skewed by competitors. Hands down the best towel out there. I have a Ford Super duty truck and it normally takes 3-4 towels to dry. With the Gyeon towel it now takes 2. Some reviewers complained about the different feel on each side. Personally, I could care less as long as it performs. The towel drys without leaving streaks on glass as well. Now I can dry with one style of towel and only 2 of them compared to 1 on the glass and 4 for the truck paint. I use this only in special applications, it's just too beautiful for utility work!